ChinaHoster Review 2019: Is ChinaHoster a Good Hosting? Getting a business online in China is a real struggle for many foreigners. Thankfully, ChinaHoster bypasses the government’s stranglehold on the internet with a range of China-optimized personal and business hosting plans that come with dedicated bandwidth. With servers in Hong Kong and mainland China, ChinaHoster provides the safest and most reliable route for anyone who wants to set up an online business in China. The company offers shared hosting, cloud hosting, and dedicated servers for personal or enterprise use. It has strong partnerships with trusted software and technology partners such as Weebly, cPanel, and G Suite. ChinaHoster operates enterprise-grade servers with a 99.9% uptime SLA and China-optimized network, which is why it’s able to provide high-availability hosting at all levels. The company also has multiple DNS resolvers across different geographical locations, which ensures the correct servers are contacted when visitors from China, Hong Kong, and Taiwan access your website. You can create a CMS website or e-store using the Softaculous one-click installer, which comes with over 50 apps. Alternatively, you can take advantage of the free Weebly website builder included in the personal and business hosting packages. 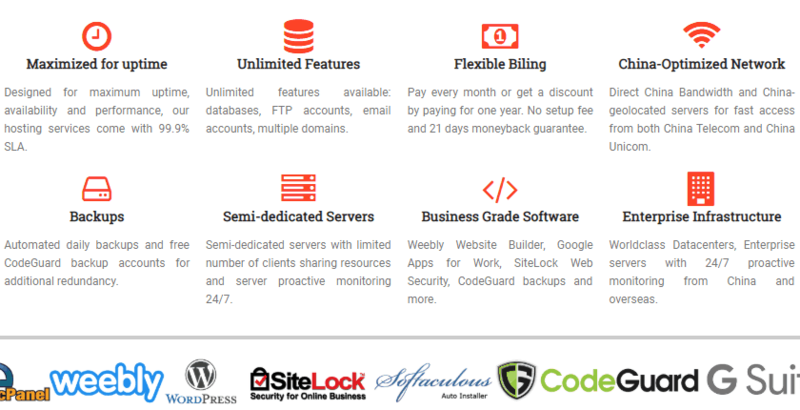 Anyone who signs up for the business hosting package also gets a free CodeGuard backup account, which is a three-in-one solution for website backups, monitoring, and restoration. In addition, business hosting customers will enjoy enterprise solutions such as SiteLock Website Security, Google Apps for Work, and more. 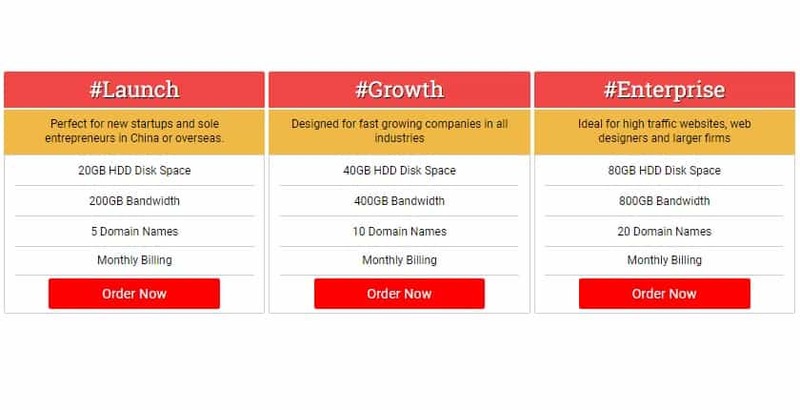 ChinaHoster’s personal and business hosting packages may seem expensive compared to those of well-known hosting providers like GoDaddy, Bluehost, and HostGator, but let’s not forget that this is a company that provides unrestricted access to a vast marketplace and is even ready to change your IP address without charging additional fees. For this reason, I feel the higher prices are justified. There are a variety of billing cycles available: 1-month, 3-month, 6-month, 12-month, 24-month, or 36-month terms. You also get a 21-day money back guarantee, so you can try out the service risk-free. I recommend that you sign up for ChinaHoster’s free ten-day trial just to have a feel of available features. The fastest way to get help is to start a live chat with ChinaHoster’s support agents, though you can also open a ticket or consult the knowledge base for answers to simple hosting problems. That said, my experience with ChinaHoster’s support staff has been less than impressive. I wrote their support an email inquiring whether they could help with GoDaddy to ChinaHoster website migration. 24 hours later, they still hadn’t responded. With a range of enterprise-grade servers, ChinaHoster is a good choice for anyone who wants to set up an online business that targets customers in mainland China. Get a China-Optimized Hosting Package Today! Wondering how ChinaHoster stacks up against other Web Hosting companies? Enter any other Web Hosting company and we will give you a side-by-side comparison.